A pair of chef shoes will carry you through the long shifts, so invest in them is just worth every penny! Every chef hates limping during a 12-hour day in a kitchen since their feet easily get sweaty and exhausted. Let’s start over by wearing some chef work shoes with cushioned soles to balance your feet. You need good arch support – a truly soft one that is not made out of steel. Safety is a big concern in all restaurant kitchens and hospitals, where slips and falls happen quite often due to the hard and slippery floors. Just like Kentucky Fried Chicken or Burger King, the staff are supplied the non-slip footwear with the cushioned insoles. Are you ready to look out for some better options? Click here for the Best Slip Resistant Shoes, or simply just start up with Skechers. Are you ready to tackle wet and oily surfaces? 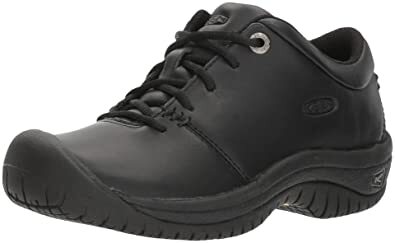 Let’s start your service with unique style and high comfort when wearing the Skechers Work Cottonwood Elks Slip-Resistant Shoe. With a smooth leather on the top and a rounded toe front, your feet find it easier to move around without feeling exhausted. 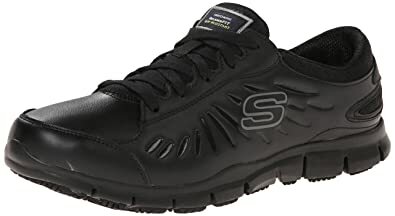 Trust me, Skechers chef shoes won’t disappoint you in the first place – the heel overlay detail combines with the “S” logo embossed in one side perfectly. This gives you a more professional and delicate look than ever! Not just that, but the shoes also feature the metal eyelets and a padded collar. Such a design reminds you of a greet-the-guest appearance, which is good and modern at the same time. Then what about their slip resistance? Its sole is tested by availing the ASTM F167796 Mark II standards. It means exceeding the .5 coefficient (C.O.F) on wet or oily surfaces. If it’s a non-slip chef shoe, then it must be as tough as nails; especially when it deals with all slips and trips in your professional kitchen. Do you agree about this as it comes to Crocs? All slip-resistant Crocs chef shoes are known for their kitchen-worthy! They will cushion the balls of your feet and offer some support during long hours. Therefore, it’s not easy to slip off in case of any spill as the footwear has the rubber bases. These are expected to last more than 7 months. Your feet now have the chance to expand and flex naturally for decreasing the fatigue. With their ultra-cushioned and soft footbeds, your feet are gently massaged for every step. Also, the dense vamp region of the footwear can guard the top of your feet against any injury and external shock. Well, there’s nothing to ask more about them! They’re the safest working shoe you can rely on when reducing all possible risks on the job. Lastly, please note that these shoes are easily cleaned with only water or even the bleach liquid. 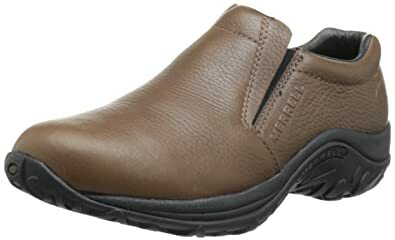 Now it’s the turn for Merrell chef shoes to impress you! Unlike other competitors, this slip-on features a Jungle Moc – this has the smooth suede upper region for extra support. What’s more, can I say about this piece of footwear? It’s simple, comfortable, and supportive, and the sticky rubber in the outsole is simply amazing! It owns a great grip across the hard and slippery surfaces while the air cushion in its midsole can ensure your long-lasting comfort. So is there anything that makes you fall in love with this footwear? It’s going to be the size consistency! No disappointment is seen here – the shoes fit your feet ideally without leaving any struggle. Within one second, they will slip on with ease and be snug enough to ensure your highest comfort. These are good enough for your dress-up moments, too. You still look good with the flat feet and they can make the end of your day much less painful. The elastic banding wears out a bit. The left shoe doesn’t fit like the right shoe. Do you have to work in a kitchen? Let’s keep cool with the Walker Oxford of Dansko! Its leather upper and modest look will attract you at first sight. Don’t you still believe it? Look at the rounded toe room and lace-up front from the shoe! You look much better if combining with your jeans and even khakis. Like other Dansko chef shoes, this version finds no difficulty in comforting you with every stride of your busy day. All you do is staying casual and relaxing in the fantastic Dansko Walker. Its lace-up has a decent leather upper area to ensure your comfort and durability to be the highest. Try it out to experience it! On top of that, no more slips and falls when you use this casual footwear. It owns a non-slip outsole that can satisfy the highest criteria of slip resistance. And your feet will be kept nice and comfy for long periods. But note that for the first time you break in, it might feel slightly tight. Wait for a few days and then you feel great again! As a chef, you probably spend extended periods working on your feet, which is a big health issue to concern. Have you wondered if this can be resolved or not? Stop stressing you out since you’ve got the Tokyo Super Grip of Birkenstock already! This pair ensures to keep up with your harsh schedule from morning to night. Thanks to its soft leather upper, your feet can relax on the highest level. And feel free to adjust the instep buckle if you desire a more personalized fit. Once wearing them, you’ll see that Birkenstock chef shoes are specially designed to meet the natural motion of your feet. They help work out those legs and boost the entire circulation. 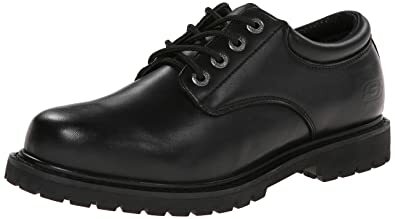 Aside from that, these miraculous shoes do not only keep your feet’s natural padding under the heel but also offer them strong traction on wet floors. It’s because their outsoles are made of the non-slip EVA and rubber. As being said, it’s not the fault of your walking, but it’s your standing that must be the killer. The whole situation will be much worse than that when you’re a female chef! Things will be solved – Below are my top 5 picks for you – if you hate slipping off the feet. It’s Mozo chef shoes’ turn this time! Now answer me, do you wish to get through your day or not? If so, don’t look away from the Mavi of Mozo. The shoes have all you want from a non-slip footwear: Comfort and style. I love those shoes! I’ve indeed gone through different chef shoes, and they’re not exactly what I expected. And especially seeking a cute work shoe is nearly impossible, but with Mozo, things are different. They’re not just nice-looking, well-made, but also comfortable to put on through a 12-hour shift. In other words, you will never feel like being a fashion failure when wearing them. The Mavi comes in the premium leather upper region with a synthetic toe cap. But what I love the most about the footwear is the heel support! You no longer suffer the foot pain after wearing them for a few times. Simply put them on every day in the kitchen for work, and you’ll see how effective they are. 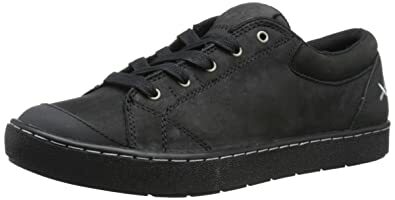 The sneaker here also features a water-resistant upper and an elastic goring, which makes it a great fit for your casual wear. As compared to other safety shoes for chefs, Skechers Eldred feels a lot better on your feet. And surprisingly, they’re pretty nice in look and totally making the day more relaxing than ever. However, the best part about the shoe is how safe they are on the oily and greasy floors. You can see that from day to day. As for the sizing, it fits quite snugly and so comfy to break in and walk. 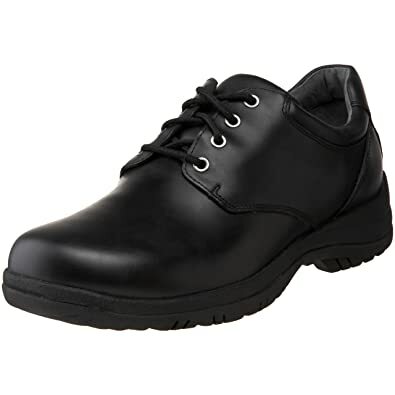 After all, I would like to recommend these work shoes for you if you work in food serving industry. There’s no back pain anymore during or right after you put these shoes on. Their soles are just fabulous on every surface. They make you feel so light on the feet thanks to the well-cushioned soles. This helps you walk confidently no matter if the floors are slippery, wet, or oily. Aside from that, the shoes won’t ever leave your feet soaked like a few mesh sneakers often do. This is probably because the tongue of the footwear gets stitched in one place. This helps keep out anything that might soak your feet or socks. Like other sporty shoes, New Balance is mainly dedicated to supporting athletes obtain their goals. With WX608v4, you will understand that this is the right choice to make. The shoes are quite comfortable to wear without causing any pain or discomfort. To be honest, this pair of shoes from the brand is ideal for anyone who spends the entire time walking around the slippery floors. They’re specially made to offer a great sense of sure footing no matter if you work in the kitchen or the warehouse. 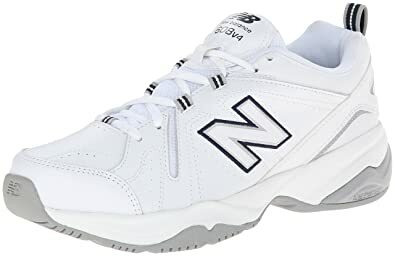 This is because the New Balance chef shoes often feature the slip-resistant outsole that is made of high-quality EVA rubber. That material naturally increases the shoe grip on the floors and prevents you from slipping off and falling. Just take care of your feet, and then they can take care of you by offering you a long-term support and cushioning. And do yourself a favor by investing in this pair of chef shoes – They’re worth every of your penny! If so, then you must work at least 40 hours per week on the feet on the hard floors. In that case, no sneaker could ever keep your feet from aching at all. 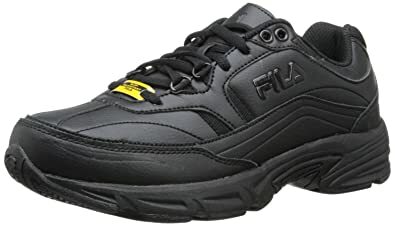 Just remove all of those worries once you go with Fila Workshift Slip-Resistant Shoe. Now, you can walk over the slippery parts and never slip at all. This is all thanks to the rubber material in the outsole. It would help your feet cut in every direction and durability for 10 – 12 hours per day. And believe it or not? The track in the bottom feels very grippy as if it never falls apart. But the top of the footwear doesn’t seem to last long since it’s apparently made of fake leather. To make up for that, they own great support and good design. Despite some weaknesses, these are quite comfortable with the adjustable memory foam inserts that are primarily used for arch support. Also, they stay true to the size, and never cause your back to get hurt even though you have to stand for too long. Slightly hard to break in. Have you ever worn the shoes that always kill your feet on the job yet? If it happened, then throw them away, but invest in a more reliable pair: Keen chef shoes! Trust me, you’ll love it for the EVA midsole support and the ability to cradle your feet for hours of standing. What’s more convenient than that? Another bonus of the shoe would be its water and stain-resistant upper that is made of leather. This also owns a 5-eye lace closure for much easier adjustability. Looking inside, you can see memory foam insole that is meant to pamper your feet anytime. But on top of that, the rubber sole of this footwear totally meets the ASTM F1677-96 Mark II criteria when it comes to the slip resistance. Last but not least, let me start out by stating that this model of Keen doesn’t seem too clunky or cause you to look masculine at all. And if you want a shoe that can work as hard as you do, and also want them to look stylish, look no further than Keen Utility footwear! Is it your first day working as a chef at a fine dining restaurant? If so, then get your favorite from my top 10 chef shoes above, and then look good for work! All of them own the double stitching and foam cushioned insoles to improve your support and safety at work. Above all, these shoes feature the fantastic slip resistance that keeps your strides steady all day no matter how slippery the floors can be. Such miraculous gifts are ready to give you everything: slip resistance, breathability, comfort, and durability. Just get them today! Most non-slip shoes differ from other casual shoes in the way they grip the floors. They have the enhanced traction in wet or slippery surfaces. How come? They make use of special materials and tread pattern, which tends to result in a much softer and more pliable shoe sole. Note that these elements act as a channel to move liquids up and away from the base of the sole. 1. Why are non-slip chef shoes important? They prevent slipping and falling accidents. In the previous year, as some health organizations claimed, slips and trips are the main cause of all injuries at the workplace. It’s about 17% of workers who were reported to be disabled due to the workplace injuries and 24% of them due to the wrong shoes. Therefore, wearing non-slip chef work shoes could help you avoid those fatalities. Slip-resistant shoes save more time and money. The above accidents will easily lead to the hospitalization and sick leaves later on. As a worker or a chef, you still have some insurance claims or paperwork to handle, right? Having a good slip-resistant footwear program can help you deal with such a mess. 2. What does ASTM mean? It’s also known as the American Society for Testing and Materials. They often test and sample different kinds of safety shoes or work boots to determine their true performance and other qualities. For instance, a good slip-resistant work footwear must be ASTM approved. 3. How to stop my footwear from sliding? First of all, all you need is having a rad, a sandpaper, a pair of scissors, and some shoe grips. Let’s use the rag to rinse the base of your footwear so that all of the dirt or debris can be removed all. This activity will be followed by sanding action, which means you must rub that sandpaper along the base of the shoes. Make sure to rub some particular places under the balls of your feet, heels because these regions are those that suffer the highest pressure when you walk.